Weekend Reading Watch: In case you missed it I posted a few comments on three IPOs we reviewed this year along with current view of each here. Natural Gas: February (NG/G8) becomes the front month contract today. Yesterday gas was able to reverse an early morning plunge into the upper $6s and close up $0.036 to $7.20 in sympathy with a rally in crude which hit fresh 1 month highs. This morning gqas is giving yesterday's slight advance back in early trading. My Number: 145 Bcf withdrawal. 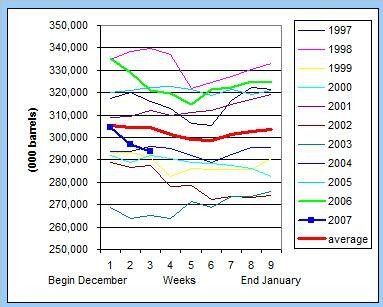 HDDs: at 200, gas-weighted HDDs were at the high so far this winter. Imports: not published by my source in this holiday week. Irritating but I would have expected little change from last week's gross level of roughly 10 Bcfgpd. Year Ago Withdrawal: 49 Bcf. My number should put storage at 3,030 Bcf which is the 4th highest level for this week of the year. This would be 3% BELOW year ago levels. Next Week One Year Ago: 47 Bcf. Consensus Withdrawal: same as last week: 130 to 140 Bcf. Crude Oil: Bigger than expected inventory draw shot crude briefly over $97.50. The February contract settled up $0.65 at $96.62. This morning oil is trading up about $0.30 hovering near the $97 mark. Inventories Keep Diving. We are now below the level the EIA predicted for a year end level just two weeks ago and there are still 10 days of data left in the year. A Note On Tax Related Inventory Selling: Stories surfaced yesterday citing inventory taxes as a source of "demand" for crude. The quoted analysts commented that often at year end, inventories fall to avoid year end taxes levied by certain states. I would offer that while this phenomenon does occur its impact in the face of supply and demand fundamentals is limited. Taking a look at the past ten December to January periods debunks this "inventory tax effect as having a significant influence". There may be some to this but in any case, its pretty small and you'll note from the falling graphs that in many case a recovery did not occur until well into January. 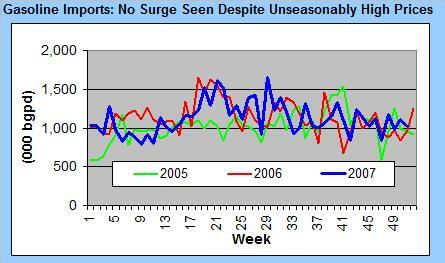 Imports: Not a problem this week as imports rallied to the tune of 700,000 bopd. With higher OPEC production and imports that remain in the band of normalcy (and no see of tankers standing off a fog bound HSC ) one is forced to ask where those barrels are going. Could the phenomenon of higher producing country consumption playing a part? Hmmm. 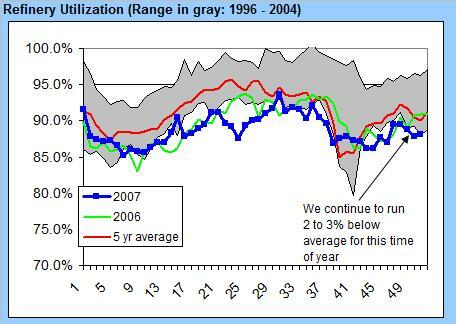 Refinery Utilization: was up half as much as expected to 88.1%. As you can see from the following graph, this is very low for this time of year. With inputs to refineries falling yet again you have to wonder where the EIA got its number on the crude draw this week. Just does not make a lot of sense (although the API reported a BUILD in crude stocks of 0.9 million barrels. 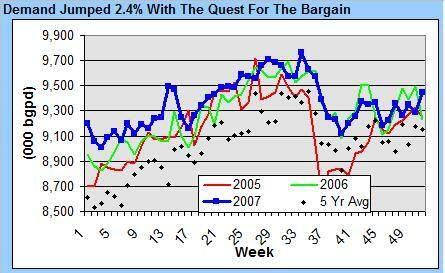 GASOLINE: Smaller than expected build yielded an all time high of $2.52 for the February gasoline contract. 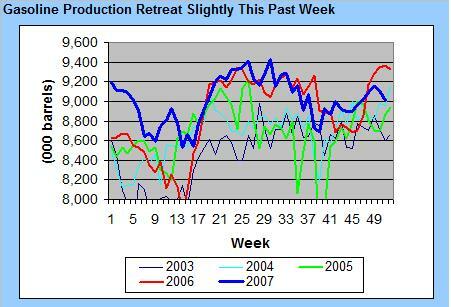 Production retreated slightly this past week. Import - pretty much spot on with trend for this time of year despite unseasonably high prices. You'd think tankers would be lined up to get gas to the states given the local high prices but a combination of U.S. environmental laws and multiple global serving refinery snafu have kept imports to the States in check. Demand Hits A Record For This Week of the Year. Remember that this was the week before the week of Christmas. So much for lagging consumer confidence figures. Or maybe this is what bargain hunting will get you. A hat a store A is $20 so you drive to store B to get it for $18 while spending $3 worth of gas in traffic. 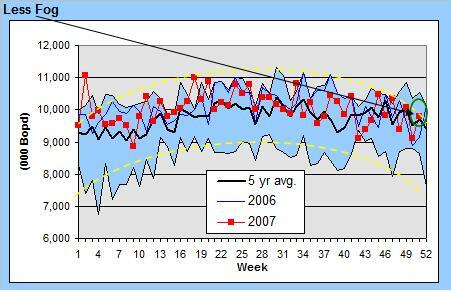 Demand rose 160,000 bpd from week to week prompting the first rise in YoY comparisons in the four weeks. Furthermore, at 9.446 million barrels per day demand for gasoline was similar to that seen in the summer. No doubt we'll see more of the same in next week's report as people continue searching for more hats up until the last minute. 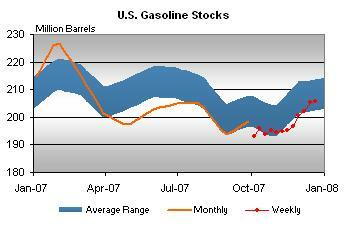 Gasoline Inventories: Well stocked for this time of year. HO stocks and production remain low. 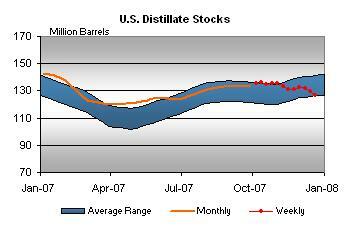 Total Distillate Stocks Continue To Fall. Just 6 short weeks ago everyone was saying "what's the trouble, distillate stocks remain high/". At the time I point out the low ball levels of heating oil and the sluggish recovery in refining capacity utilization levels. And now, total distillates are falling out of the acceptable band of inventories for this time of year. And that with temps that have been, on the whole, slightly warmer than normal. (CRK) have been wanting to get long sub $35, yesterday knocked the stock about a bit as the sale of shares by the CFO gave some investors fright however his interests are well aligned with the company (> 400K shares) and its was a use or lose situation on some 7 year vested options. Otherwise its a fairly light news day. I'll have a list of companies that tend to get a jump start on the new year in the weekend over Monday post. (DO) picked up a small trade position in the DO $155 January Calls for $1.75. Analyst Watch: zip, zilch, nada. Suggestion Watch: Got any? We're always looking for ways to improve the sight. Drop a comment or send an email to zmanalpha@gmail.com. Thanks in advance and have a great weekend! This entry was posted on Friday, December 28th, 2007 at 9:15 am	and is filed under Uncategorized. You can follow any responses to this entry through the RSS 2.0 feed. You can leave a response, or trackback from your own site. more like luck but I’ll take it. 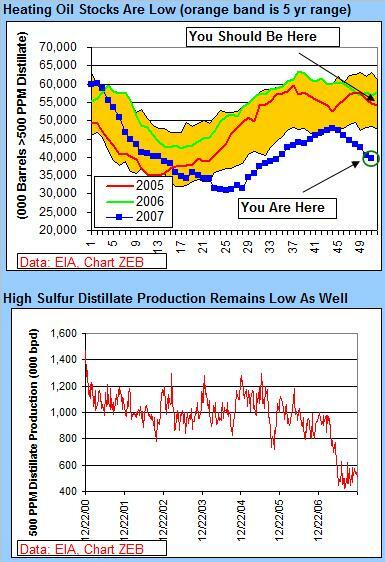 Ultra Petroleum announced that for the third time this year, it is increasing 2007 production guidance. The new production guidance for 2007 is 120.0 billion cubic feet of gas equivalent increased from the previous guidance of 116.5 Bcfe. This represents a 31% increase over 2006 inclusive of substantial shut-ins during the year and the sale of the Chinese asset. Production guidance for the fourth quarter 2007 is 32.3 Bcfe, which is an increase from the previous 28.8 Bcfe guidance. Additionally, two executives will be retiring at year-end: Stephen R. Kneller, VP – Exploration, Domestic and Michael G. Patterson, VP-International. Both individuals have played key roles in Ultra’s success over the past handful of years. CNBC quoting PF this morning saying that he believes the energy market is setting itself up to make a major top followed by a very large fall. As an aside his daily newsletter states that he also expects to see a huge build in crude next week. FF – thanks for the headsup on Ultra…missed that. Energy is still the place to be looking at where the stocks are setting to close 2007. Thanks Nicky, did he say why he sees a big build next week? If its taxes I really should send him the chart of why that generally is not the case. Personally the move up this weeks is very suspect based on the non existent volume which is not typical in third waves which this appears to be. We need to back fill before a final big push higher I think. no when I make a good call, it is good luck. You know what you are doing. They are just confirming it. Yes he did Z – can i copy and paste it here? how about a short synopsis or a link to it. you know, the lawyers and all. I can’t send a link as its an email. Check your email. Its printed all odd today so can barely read it! But its to do with imports. Re #4 Ultra Petroleum. Good news on production, but they will miss Steve Kneller. He was the Pinedale (which provides the bulk of their production) driver for the company. Thanks Nicky. He may be right but more reasoning and few exclamation points would be a better way to convince me. Z – there are two counts still on the table but only as long as the contract high at 98.12 holds. IF it holds then this could still be playing out as an abc correction for wave 4. This count is running out of room but if we roll over hard here it is still a possibility. If we take it out higher then wave 5 up is in play and we are in iii of that. We should see at least 105 (115 is not out of the question) before the top is in. Even with the latter count I would expect to see us back fill towards 95 before the final assault on 100 plus. We are going to need to see this move come with much higher volume. CNBC reporting that they are expecting a draw of 151 bcf for nat gas. Energy completely shrugging off the bad economic data. Blinkers on this is all about $100. FF – they should be out at 10:30 EST. I saw DJ range of 130 to 140, I’m at 145. Nicky – agreed. Hate that it impacts the stocks as well. We don’t need these prices for E&P to have a great 4Q and 2008. $80 would be just fine and wouldn’t crunk the consumer. What’s absolutely maddening Z is that this is all about a few traders which is just exaggerating the move. We should have guessed this would happen in hindsight. 2 weeks ago we saw a 146 pull with 198 HDDs. Only difference was this one came in front of contract expiry and there was a slight contango which could have held some storage back. If anybody gets gasdaily, I’d be much obliged to see the past week’s imports from LNG and Canada. 165 Bcf; SWN I think a buy in here. now down 3.8% YoY, 7.9% ahead of the 5 year. This is about as good a report as gas could have hoped to have gotten. CHK still drifting up here despite NG’s reluctance to move up. market reaction to gas number: yawn. They are short and the trader’s assistants who are working today will not go run this up for anything. Nicky: re your counts. there is another possibility, (assuming you’re talking Elliott Wave). This could be a running wave 4 Flat in which case a new high is possible in Wave B before wave C of 4 starts, leading to another new high for wave 5. As usual there are multiple counts possible, with different results portending. One of the problems with this type of analysis, it often becomes clear only when the pattern has resolved itself. Nicky – just out of curiosity, you said PF was bullish re nat gas, right? re 31…should I get that Elliot Wave for Dummies book? T – if your out there I had a fix for you last night re a third monitor for your laptop. NEW YORK — Crude-oil futures jumped to their highest price in a month Friday after the dollar weakened on a gloomy U.S. housing report. As data showed new U.S. home sales making their steepest drop in 17 years, traders shrugged off their ramifications for the economy and oil demand to focus on implications for the dollar, whose slide has helped lift crude this year. Light, sweet crude for February delivery was recently up $1.01, or 1.1%, at $97.63 a barrel on the New York Mercantile Exchange, after rising to $97.85 a barrel, a new one-month intraday high. Feb Brent crude on the ICE futures exchange rose 81 cents to $95.59 a barrel. Sales of single-family homes decreased by 9.0% last month to a seasonally adjusted rate of 647,000, the Commerce Department said Friday. Year over year, new-home sales were 34.4% lower than the level in November 2006. Currency traders responded by pushing the dollar down against the euro and yen. The greenback’s weakness makes dollar-denominated oil futures cheaper for buyers using other currencies and blunts the impact of high oil prices outside the U.S.
Crude bested new highs made Thursday after the assassination of former Pakistan Prime Minister Benazir Bhutto led to fears of risks to the oil supply. The assassination touched off violence that has killed at least 23 people. While Pakistan isn’t an oil exporter, fears that terrorism there could spill into the Middle East seemed to add a premium in the marketplace. Pakistan’s interior minister told The Associated Press Friday that al-Qaida and the Taliban were behind Bhutto’s killing. Oil has also been supported by a sustained decline in U.S. crude stocks, which fell by a surprise 3.3 million barrels last week in its sixth consecutive weekly drop. Price moves have been exaggerated this week amid light holiday volumes. That leads some analysts to believe oil could test its record intraday high of $99.29, reached Nov. 21. Front-month January reformulated gasoline blendstock, or RBOB, rose 1.38 cents, or 0.6% to $2.5100 a gallon. January heating oil climbed 1.65 cents, or 0.6%, to $2.6968 a gallon. Could take the 37% one day gain on the DO and buy a few bottles of Cristal for new year’s. Z You have good taste. I am fond of the Cristal Rose. While on the topic of booze, my brother-in-law, who occasionally has his good points picked me up a bottle of Sequum Carbernet which would be a good gift for the geologist or wine lover on your list. No vineyard but it is sources from 4 regions with specific soil characteristics and I give it a buy rating. Very small lot made I think but worth the price. Cramer sold 189 shares of RIG today. He’s still holding 1000 shares. dmharvey – great to see another ewaver on here! Yes agree re your count and b could be playing out as a double zig zag. It HAD been my preferred count until this week! Even with the b wave count we need to see a pullback and another move higher to finish the b leg so it is going to take a few more gyrations before the count is clear and as you so rightly say it is often not until after the event! One of the things bothering me about this being iii up in 5 is lack of volume which really is not typical for a wave iii. So often the moves made during these low volume weeks are reversed which is why we cannot dismiss the b wave at this time. I would favor some sort of short term pullback here and then volume entering the market again in the New Year when the traders return in numbers. I think the big players are unlikely to want to buy at this level and in fact the open interest indicates this move has been short covering rather than new longs entering the market. I am also trying to work this in with cycle high forecasts for January/February. Under either account I think you will agree we are going to make a significant top. PBR really trying here for a breakout, also CHK having the best day in recent memory (whoopie you say? 60 cents) hey, I’ll take it as the chart is shaping nicely. SWN also coming off its lows. As far as nat gas goes there is no conviction in the slight move up and everyone is fearful of another downdraft as has been seen in recent weeks. I’d point out that we have yet another easy comp next week and that yet again I expect the early forecast for degree days to come up on Monday morning as it seems to be have been colder than expected again. So we should see a number of 120 or better in the face of year ago pulls of 47 Bcf. This will send us towards a 5% YoY deficit and may get some notice as gas hovers around 7.25. Nicky: agree completely that we should be making a pretty big top soon. The move from the Dec low is almost certainly part of a corrective move, it just doesn’t look impulsive to me (these are so much fun to analyse, not!). The two legs from the Dec low are approx equal, so far. We’ll just have to see what happens next week when volume returns. DM – as far as that goes, I’d bet on a little selling next just b/c we’ve been drawn up in a volume vacuum. market all of sudden turns red and whacks gains in things like DO, still a good bet there if you missed it. So the market reverse on the new home sales data? Wow, shocker. What the heck does that have to do with the price of a rig in China, or anywhere else for that matter, lol. SWN positive, think it breaks out next week. They should just lock the bathroom doors and tell people to hold it. Water ain’t cheap. Unfortunately Z’s plan would interrupt stage 2 of this sequence. But if they *do* lock the the bathrooms, they should start taking shareholder value seriously & sell all the fawcets for scap. CNBC oil trader shamefully ramping oil on the back of Pakistan – what are these guys smoking? hello guys Pakistan doesn’t produce oil and nobody has a hand on their nuclear arsenal so what possible effect can Pakistan have on oil???? #48 – BAC will just raise their ATM fee. Did Nicky’s broker flip or flop this time? Since he is short oil, should we see a mini run into late next week? I am also afraid of our NG stocks since he is long NG! As Z says he just flip flops. He never had a decent argument for it going up so how can he make a decent one for it falling! At least now he is short he can call it for what it is which is speculation! Sam I liked your list via email. I’m responding here b/c I know you don’t like to get email at work. I would add mid and large cap E&P exposure. Cheap and growthy if you are in the right stocks. Also, refining should do very well again in 2008. VLO and TSO safest bets. Complete agree re clean energy…I think solar could get a nasty hit early after this run like the drybulks did … there are reports late 08 / early 09 could see a glut of wafers but it will affect each maker differently and I’m still sorting through them but the low margin players could get ouched. Z – Re #37. Thanks for the info. Hopefully Mr. Esquire isn’t angry because you don’t have a liquor license. Speaking of wine, for a special occasion with Mrs. Z, try to find a bottle of 1997 Harlan to bring to a nice restaraunt. Oil rocketing lower into the closer. They may be getting a jump on next week’s profit taking. 1997 was such a great year for cabs. Unfortunately I’d have to up my rates to even sip that nectar. And a C.P.I. report that said this was all just a bad dream. #58 Z – I already own those. This is my new theme for 08. You welcome to post it. Here is a list of what I want to own in 2008. PBW – Powershares WilderHill Clean energy ETF. Take 2.5% position now, and if the solars, etc. fall off, double up/down to 5%. I believe that as oil continues to climb, the alternative (Solar, wind, etc) will continue to climb. Toyota – “Plug in Hybrids” will be the talk of Wall Street as time goes forward. GM and Ford will manufacture the cars starting in 2009. Toyota will also. I think looking at history that Toyota will have a better product. I believe if Gasoline gets up there (North of $4.00), then Americans will stand in line for these cars. The car makers won’t be able to make enough. It will be cheaper, even if the cars are more expensive to run them on electricity, than fossil fuel. Utilities – If I am right about Plug ins, then the Electric Utilities will be the winners. Utilities now provide power mostly during the day. If consumers start buying plug in cars, then they will charge at night, which will boost earnings, because currently at night Utilities aren’t selling as much. Coal – FDG, BTU, ACI. Three current ways to make electricity; 1) Nuclear – They are not building any more plants at this point. It takes at least 5 years to build out a nuke. NIMBY – Not in my back yard. 2) Hydro – Water will continue to be a problem going forward. 3) Coal – Burns dirty, but it is plentiful. That’s why you buy King coal. Commodities – MOO, DBA, JJG, RJA and RJI. Commodities usually have a run of 10 to 15 years. 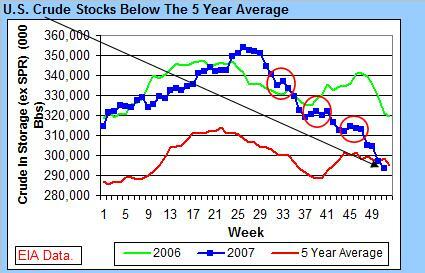 Yes they may come off bit and are volatile, BUT the trend is up over that period. We are only in the 5th year so far. GLD, also can be used as a hedge on the US dollar. Good article in the Scientific Amercian Magizine on Solar. thanks fr the monitor suggestion. amzn rips off Canadians with their friggin broker surcharges and exorbitant shipping rates. im looking into these samsung monitors though. bought a $180 watch on there for someone and they tacked on $120 for broker surcharges and shipping. last time i checked it was like $7 to ship a watch and broker fees are like $10. you guys have it so easy lol. and now with the dollars parity were being ripped off by retailers in most cases (the same discrepancy in prices still exists) so i buy everything in the states. i found some nice arbitrage opportunities in sightly used luxury / exotic cars for import to Canada (well after i drive them for a few months). i haven’t been on much in a while god to see eve ones still plugging away. canadian usually don’t work from Christmas eve till Jan 2. found some nice exits this week and am all in cash. Z – Is NFX starting to go again? Could they possibly make the JAN 55’s good? Re #62 – excellent Samborne! Ram – re NFx …certainly the 55s are worth a shot… but I’m not getting excited until it breaches $54. Next week could be crazy so I’m not adding to much in here. PBR really looks like it want to go test 119. Nat gas and SD doing quite nicely today. Anybody notice the piece on the three IPOs last night? NEW YORK — Crude oil futures ended lower Friday as traders booked gains and grappled with concerns about an economic slowdown. After dwelling in positive territory most of the day, light, sweet crude for February delivery sank in the final minutes of the pit session to settle 62 cents, or 0.6%, lower at $96.00 a barrel on the New York Mercantile Exchange. Brent crude on the ICE futures exchange fell 90 cents to $93.88 a barrel. Amid light trading, crude earlier had inked a new one-month intraday high of $97.92 a barrel. It remains up 2.9% on the week. Market observers say that with U.S. oil inventories at their lowest levels in nearly three years and worsening instability in Pakistan after the violent death of former Prime Minister Benazir Bhutto this week, crude in the short term could still be poised to approach its record intraday high of $99.29 in the days ahead. After a four-day runup, however, traders seemed ready to lock in gains. “It’s weekend profit taking,” said Gene McGillian, an analyst at TFS Energy Futures in Stamford, Conn. “People are looking to lighten up ahead of the holiday weekend.” Exchanges will be closed Tuesday. Traders also wrestled with the implications of a U.S. Commerce Department report showing new U.S. home sales fell 9% last month to the lowest level in a dozen years. The oil market initially rallied on the news, as it weakened the dollar against other currencies. The dollar’s decline has contributed to crude’s 57.2% rise this year as it blunts the impact of high crude prices on demand outside the U.S. Volatility for the week was heightened by thin trading between the western Christmas and New Year’s holidays. Analysts say a test of crude’s recent strong performance will come next week, as large trading operations reenter the market after New Year’s Day. “Watch when the big players start to file into the market again. That will give us the best indication of which way they want to take this market,” said Stephen Schork, the Villanova, Pa.-based editor of energy market newsletter the Schork Report. Front-month January heating oil fell 4.33 cents, or 1.6%, to settle at $2.6370 a gallon. January reformulated gasoline blendstock, or RBOB, dropped 3.65 cents, or 1.5%, to $2.4597 a gallon. Have a good weekend everybody. Check out PBR into the close.